SAGITA COM - sagitasoft.com - Pinnacle Studio 16 Ultimate adalah editor software multimedia dan lebih mudah untuk digunakan dalam membuat HD / video 3D atau file multimedia lainnya. Anda mendapatkan semua fitur dan teknologi yang handal dari Pinnacle Studio Plus seperti membuat atau mengedit file multimedia di mana saja pada jumlah yang tidak terbatas, di samping beberapa fitur yang telah disajikan, Pinnacle Studio 16 Ultimate juga dilengkapi dengan berbagai efek, transisi dan keberagaman animasi. Add excitement with over 2000 2D/3D additional effects. Create custom-fit soundtracks with Scorefitter. Create Dolby surround Blu-ray/ DVD discs and export to your favorite digital devices and formats. Create eye-popping effects with Red Giant Filmmaker’s Toolkit and Motion Graphics Toolkit. Edit on unlimited tracks with frame accuracy in HD and/or advanced stereoscopic 3D. Enhance and correct movies, photos and audio right inside the media library. 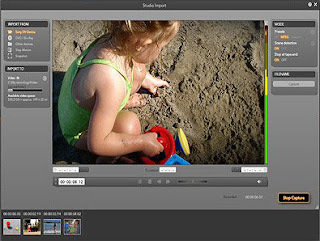 Import clips and movie projects from Pinnacle Studio for iPad1. Includes green screen for shooting with superimposition in mind. Layer animations and titles easily with included Montage templates. Preview timeline and source clips simultaneously. Quickly learn to make great videos using the included video tutorial DVDs. Storyboard quick first draftseven create movies automatically. Use the trim editor to set source clip in/out points, then drag trimmed clips to the timeline for perfect cuts just like the pros and much more. 3.8 GB Free HDD Space. gan, gimana cara dwonloadnya nih...?